The Green River between Fontelle Dam and Flaming Gorge Reservoir in Southwest Wyoming is a robust fishery that draws anglers from all over the country. Fishing has been good in recent years, but there is always a way to make it even better. Members of the Seedskadee Chapter No. 533 believe we have discovered a missing component to the fishery. Concern has developed over the years about a lack of juvenile fish habitat in this section of the Green River. After looking over Google Earth and walking the banks of the river, members found evidence of pre-existing side channels before these reservoirs were created. From the removal of over 1,500 juvenile fish from the Hamp Number II ditch in the refuge before installation of the fish screen, this suggests that side channels are critical habitat for juvenile fish development. With a strong relationship already in place at the Seedskaee National Wildlife Refuge our chapter worked to formulate a plan for a side channel project within the Fish and Wildlife Service refuge. The Green River offers great fishing, but little opportunities for juvenile fish to find suitable habitat. The Seedskadee Chapter of Trout Unlimited is hoping to change that with money from the Embrace A Stream program. Brett Prettyman/Trout Unlimited. Seedskadee Chapter was able to compete in the Trout Unlimited Embrace A Stream grant program and the Embrace A Stream (EAS) Challenge after writing a grant to raise money to open up some of these channels along the Green River. Through generous donations from all walks of life and EAS Challenge’s prizes, we raised more than $6,000. 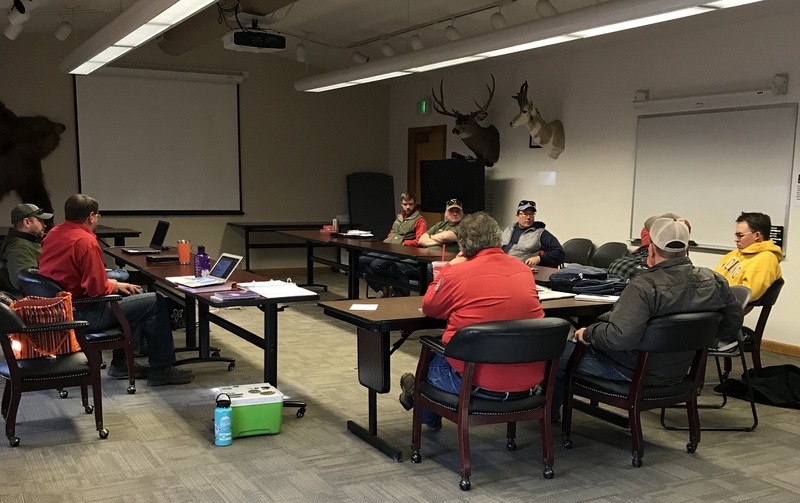 In mid-December 2018, the chapter — along with our partners from Seedskadee National Wildlife Refuge, Wyoming Game and Fish Department in Green River, and Trout Unlimited staff in Green River — sat down and created a game plan. The first step is to have the side channels surveyed, then the survey data will be analyzed to see which side channels could be opened up based on the amount of material to be moved and time needed. The goal is to open three per year. There are 26 side channels that will be surveyed this coming spring. The second step will involve pre-monitoring these side channels by electrofishing any visible water within the side channels, taking pictures, upstream and downstream, document how much of the channel is wet and what fish species are present. Electrofishing will be completed by Wyoming Game and Fish Department’s fisheries biologist and a few of our members. Once pre-monitoring is complete, construction to open the channels will begin which will lead to post-monitoring. Once the survey work and the engineering plan from One Fish is complete, the team and our project partners will sit down again to decide on a schedule to pre-monitor our top side channels before having the crew at Seedskadee National Wildlife Refuge begin construction. Seedskadee Chapter No. 533 of Trout Unlimited could not be more thankful for this opportunity and look forward to keeping everyone informed of our great project here in Southwest Wyoming. Sadie St. Clair is president of the Seedskadee Chapter of Trout Unlimited.